Medicare ranks Precise with 5 out of 5 stars for quality of care. 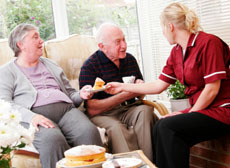 Precise Home Care is a Medicare-certified home health agency. Our primary focus is patient satisfaction, positive clinical outcomes and physician satisfaction. We provide services seven days a week, 24 hours a day. (904) 448-8670 for any assistance. We appreciate your support and look forward to providing the best service possible for your health care needs. Our services are covered 100% by Medicare, provided patients meet the defined criteria.